When the board exam performance goes nowhere, students would point to their teachers as the culprit. We'll we cannot blame them. But do we really have to blame the teachers outright? Before going any further, let me paint a picture of teacher-student knowledge exchange. When a teacher share knowledge to his students, not all will be received well by the students. Students have different capacity to absorb the knowledge shared by the teacher. For a perfect knowledge transfer, the knowledge shared by the teacher, should match the capacity of the students to receive. If the knowledge shared by the teacher is overwhelming, students will be shocked. On the other hand, if the knowledge is too miniscule, students would laugh at the teacher for being dumb. But in reality there is no such thing as match made in heaven. One has to select between too much or too little knowledge. I guess too much is better than the latter. From what is explained above, there are two actors involved here: student and the teacher. For the purpose of this article, we concentrate on the teacher. Now, let us examine a model for knowledge sharing by a teacher to understand how knowledge can flow based on a teachers' motivation. 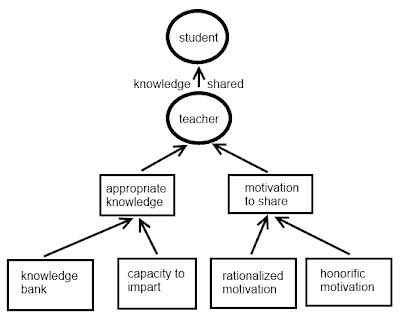 Knowledge shared is a function of appropriate knowledge and motivation to share. If a teacher has the appropriate knowledge and he is highly motivated, he can effectively share what he knows. Even if he has the appropriate knowledge but he is not motivated, then there is no knowledge shared. If he has the motivation but does not know anything, then knowledge was not imparted. Appropriate knowledge as defined in this article is the knowledge that is at par with the students' capacity. It may not be directly match the capacity of the students but at least it is on a level understood and can be assimilated by the students. Knowledge is a function of knowledge bank and the capacity to impart. Knowledge bank is nourished by a teachers' further acquisition of knowledge. This can be done by research, self-study, seminars, conventions, and pursuing graduate studies. It is the obligation of a teacher to really nurture his knowledge bank to make it relevant and attuned with times. But even if a teacher has his PhD or EdD, it does not guarantee an appropriate knowledge. A teacher should have the skills to select the right lessons and to employ right strategies and skills. This is like a withdrawal slip. Without it, one cannot withdraw from the knowledge bank. Right teaching strategies does not include intimidating the students by projecting you are a "terror" professor. This approach will motivate students to learn but for the wrong reason - fear. On the other hand, if a teacher possesses the best teaching skills but his knowledge bank account is bankrupt, then there is no knowledge imparted as well. There are two types of motivations: rationalized and honorific. In a rationalized motivation, a teacher get motivated by salary increases, promotions, and recognition. One of the traits of a teacher is that they can be satisfied easily. A five hundred peso increase in his salary can make him throw a party worth a thousand! Even a promotion with not much salary increase makes him smile just for recognition. Let me cite an example. During my first year at USEP, we produced board topnotchers (no.1 and no. 4 in board). The then president Dr. Ed Prantilla gave us (the teachers) individually certificates of recognition for the performance in the board. We used that as additional points for our NBC (see below). It motivated the USEP AE instructors to study more to improve their teaching. Right now, majority of the AE instructors of USEP have masters degree and overtake USM as Center of Development in AE education. How much more if the university can give a teacher substantial increase in salary? On the other hand, a teacher is demotivated if he is neglected for so long. A teacher is usually not a radical type of guy, he would just retreat in a corner and talk to the walls about his heartaches and dissent. However, this state of mind slowly eats his person and his motivation to share. And through the years, this will have impact on his enthusiasm to teach. A proactive management needs to seek out teachers' dissent before it can be a systemic problem. The government has seen this predicament of teachers way back. Before, the promotion is based on available items (just like the regular employees of the bureaucracy). When a professor retires, associate professors compete to get that item. This kind of competition is counterproductive. It pit teachers against each other to the extent that it can lead to backbiting. That is why the central government has instituted measures to make sure that teachers are evaluated according to his own merits regardless whether a higher rank is open or not. One teacher upon satisfying the needed points can be reclassified. This is the so-called NBC 461 which has evolved from NCC 69. The only role that the management has to do is to make sure to evaluate the teachers every two years so reclassifications (promotions) happened in every two years also. They say that sometimes a teacher is a fool (please read: ganyan din kami noon). That even with meager income, he can still afford to smile. This is where the honorific motivation kicks in. We can also call this as dedication. Sometimes, it is a struggle between a rationalized and the honorific motivation. When rationalized motivation is so negative compared to honorific motivation, this is the time that a teacher gives up teaching. We assumed that honorific motivation is always positive. It is the rationalized motivation that can drag the motivational state of a teacher. But so long as the conviction that teaching is a noble job, negative rationality is checked in abeyance by honorific motivation. Using the factors discussed above, I argue that for a outstanding teacher to emerge and stay in the university, the management has to invest in graduate studies (more scholarships please) and enhancing their teaching skills (for free!). It would also be rewarding if promotions are done in an up-to-date, equitable, and transparent way. After all it is not the money a teacher wants, it is respect. Are all of these factors met?